With summer knocking on our door, Plinkity Plonk presents you "Holiday Diary" by FLIM; the perfect soundtrack for your upcoming holidays. The album is entirely based on field recordings and melody sketches made during Flim's various holidays in 2002. The whole album was put together in a single session on september 15, 2002. The results are beautiful, laid back sketches with a very private and intimate atmosphere. 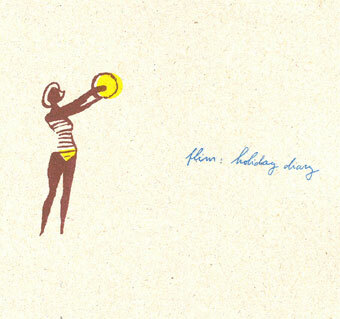 'Holiday Diary' is released in a limited edition of 500 copies and comes in a gorgeous hand-printed sleeve by Knust, Nijmegen, designed by Meeuw. The summer arrived quickly this year. One evening I was sitting in my apartment, wearing a sweater and boiling a pot of water for some tea, an unmistakable chill in the air causing some doubt as to when the warm weather might finally arrive. I fell asleep curled up under a heavy duvet; closing my eyes I knew the unmistakable comfort of sleeping in an immensely comfortable, familiar bed. The following morning I awoke with a jolt, feeling overwhelmingly warm; the air was stale, hot, humid. I flung the duvet from my bed and stumbled, still a little sleepy, over to the window. The sun was shining in the streets, the trees seemed suddenly green, and my neighbours, whom I saw one by one passing by my window, were all wearing linen. How long had I been sleeping there, under that duvet? Did I wake up in another time, another place, in someone else's body? Discarding these feelings of panic, I quickly dug up my summer clothes from my wardrobe, got dressed and stepped out, feeling the first breath of the summer breeze on my face, and took a long, deep breath. Even if things this year didn't really unfold in this way (who was this "I" in the paragraph above, anyway? ), the transition into summer always comes as something of a shock. The holidays can never arrive soon enough, if you're lucky enough to have them, and yet they seem to pounce on our lives like a most welcome surprise. We pack our bags in a flurry of euphoria and run out of our homes like we're abandoning our past lives completely, and head for a foreign land, or the nearest coast, or simply someplace else, so long as the same four walls don't surround us day and night, as long as we can forget our everyday troubles, regain a certain sense of levity in our lives. And these holidays bring us that levity, though they also bring with them other things, filled with both sorrows and joys, thoughts both carefree and profound, like life itself. FLIM Holiday Diary (Plinkity Plonk, plink 012): Hinter Flim steckt der 1971 in Mühlhausen geborene Enrico Wuttke, der 2002 für zwei Tomlab-Veröffentlichungen Lob einheimste. Dass seine Urlaubserinnerungen auf dem Beequeen-Label auftauchen, ist wohl der dialektischen Subtilität F. de Waards geschuldet, der den durch Kormplastics-Muziek blutig gekratzten Ohren hier Balsam auf die Wunden cremt. Flim lässt im ferienparadiesischen Dolce far niente ganz entspannt seine Gitarre plinken, während ihm sanfte elektronische Brisen durch die Haare streichen. Eine weich dröhnende Sonnenorgel sorgt für 30° im Schatten. Mit schlaffer Geste pflückt er versonnene Pianotrauben aus den Tasten. Der Aufschwung in federnden Minimalrock kommt dann fast unerwartet. Das Piano beginnt mit kreisenden Repetitionen, kippt dann aber um in leicht melancholisches Einfingergeplonke. Ein Akkordeon greift diese süße Wehmut auf, die zu einem dichten, von Grillen durchzirpten Drone verklumpt.. Der Wind frischt auf, zerrt und rumpelt am Fahnenmast und unser Urlauber sieht zu, dass er rechtzeitig das Hotel erreicht, bevor es zu Stürmen beginnt. Flim versteht es nicht schlecht, sehr weit weg von pauschaltouristischen Sommerhits Eindrücke und Stimmungen vor 'Augen' zu führen, wobei wohl jeder das 'sieht', was er sehen will. Ein neues Flim-Album,Hurrah!Und,hey,kann bei so einem Labelnamen was schief gehen?Plinkity Plonk also ein neues Sublabel von Kormplastics,das leider nur 500 Stück dieser wundervollen Flim-CD gepresst hat,also schnell sein.Wunderbar luftig und leicht loopt die Gitarre gleich zu Beginn,aber das bleibt nicht so. "Lime " zum Beispiel dreht den Verzerrer nach einer sanften Einstimmung an der Orgel voll auf und lässt nur ganz vage die piepsenden Zupfer durch. Dann steht das Klavier ganz für sich allein,trumpft stolz auf,spielt traurig den Horizont ab und wir sind gefangen. "Above Seagulls " ist die Flim BigBand und eigentlich sollten wir hier gar nicht so reden und schreiben,denn hat Flim einmal angefangen,kann man sich sowieso nicht mehr vorstellen,auch nur eine Sekunde ohne diese kleinen, schüchternen Ohrwürmer verbringen zu können.Alles völlig undenkbar. Tracks wie "Home " oder "No Guitars Please " treiben einem die Tränen direkt in die Augen.Alles ist so wunderbar.Einfach alles.Mit oder ohne Verzerrer. The phrase "thrown together" denotes carelessness, but it's not always so. It's possible to be both spontaneous and reverent. After beginning his recording career with the intensely focused Given You Nothing, which consisted mostly of solo piano, Flim's Enrico Wuttke has loosened up and started to experiment. Most of the limited edition Holiday Diary (500 copies were pressed) was recorded in a single day, pieced together from field recordings and melodic fragments played by Wuttke on guitar, organ, piano and accordion. By definition, Holiday Diary was thrown together, perhaps, but there's something interesting at work. Wuttke has a knack for making seemingly incongruent sounds work together. The opening "Murmer Room" is built around a loop of a plucked acoustic guitar, and Wuttke layers keyboard and percussive sounds, the random banging of a drunk navigating a darkened room. The following "Lime", one of two tracks recorded in 2001, opens with shifting chords on what sounds like a pipe organ, eerily evocative of Popul Vuh, and then a massive, distorted power chord shatters the meditative mood until the organ eventually resurfaces. "Current Description" is a dark and sad piano solo with just a faint wisp of processing, and here Wuttke's 25 years of training are apparent, as he squeezes every drop of feeling from the gulf-like spaces between the notes. Holiday Diary is a back-and-forth kind of record that jumps between sounds and styles, but it works. Shifting gears yet again, "Above Seagulls" displays Wuttke's oft-stated love for Talk Talk's Laughing Stock, with loose, booming drums and a circular chord structure ribbed with tension. Then it's back to piano for "Home", a minimalist piece that could have come from Philip Glass' solo piano record. "No Guitars Please" is a short piece for accordion, and then "Ecstatic Brown" is a return to field recordings, piling identifiable scrapes and bumps with throbbing organ chords in the manner of C-Schulz & Hajsch before releasing the tension by folding in a delicate piano melody. Kid606 and his ilk brag of being able to make an album in one night, but Holiday Diary is different. It feels like a backlog of ideas assembled quickly for posterity, yes, but somehow the slapdash nature of the project seems perfect. It feels organic, simultaneously random and unified. I'm not going to call Wuttke a genius, but after hearing three albums I will say that his music is unusually fresh and unique. Who else is combining the most trad acoustic sound possible (untreated piano) with heavy electronics? His music is generally serious with a faint whiff of academia, but Wuttke keeps his eye on the ball and moves to maximize the effectiveness of each individual track. And most importantly, he sounds like no one else, which, these days, counts for a lot. ...corpulent lobsterized flesh cascading over baggy tablecloth shorts...slit-faced Gap girls with meaningless henna tatts...the occasional waft of sizzling meat grease...bathed in the hazy rays of an all too shy sun - Anytown, Britain, 2004.